I went to visit California Badminton Academy earlier today and had a nice long chat with the owner. Here I give you guys the exclusive look at this brand new badminton club in Fremont. badminton clubs are popping up left and right here in the bay area, just this half year alone, we are getting 2 brand new gyms with an additional 47 courts and there are new ones rumored to be in the works. CBA is the latest addition that is planned to be opened at the end of May. before i go into any details about the club, i want to mention a few words about the owner, Rose Lei. Rose was a former Chinese national player back in the 70s. the 70s was a time before China was able to join the world badminton federation and thus were shut out of tournaments like Thomas Cup and All England. the skill level of the Chinese players, however, is a head above other countries. the fame tour that was taken by the Chinese for friendly matches in Europe where they end up with complete victory is a proof to that. Rose was part of the Chinese team in that tour, along with guess who, Hou Jia Chiang and Tang Xinfu. even though that was a time even before i was born, i can tell from talking to her that badminton still flows in Rose’ blood. she talks about badminton with a passion, which is not different than any of us here in BC. she talks how she thinks and dreams badminton day and night, she is passionate about teaching youngster, she talks skills and she talks strategy. she knows a lot about the Chinese teams back in those earlier days. and she mentions how she is still in contact with a lot of the players. we had a long 2 hours chat and i really learned a lot from her. her passion with badminton fuels the way she is setting up the club. the club motto of “Strong Mind, Strong Body, Strong Skill, Strong Community” captures her vision of how the club is run. her systematic and unique training methodology not only encompass skills, but also systematically build mental strength. as a top level player herself, she understands that skills alone do not win a game, badminton is a chess game that takes both skill, tactics and strategy to win. 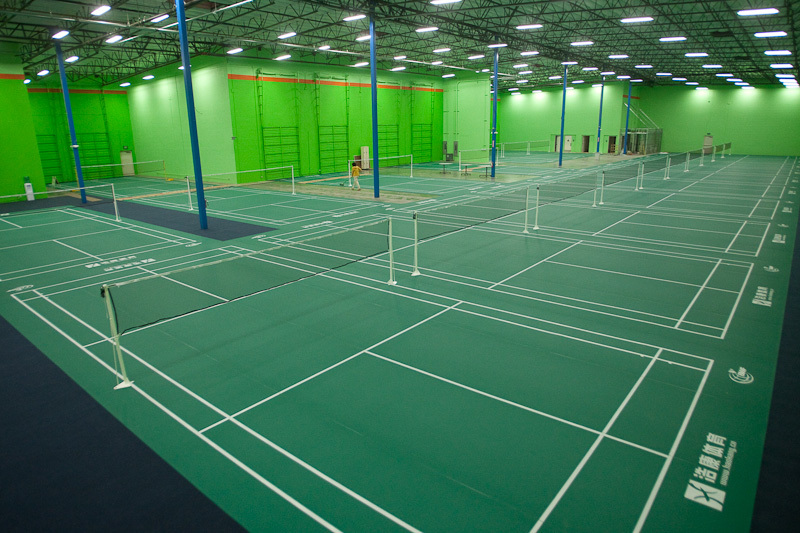 CBA offers 18 badminton courts in a spacious 35,000 sqft converted warehouse in Fremont. the club is conveniently location just off I-880 and 238. the choice of the location is excellent as it is almost visible and very accessible from the highway. there are a few strip mall right across from the club. the warehouse itself offers a ceiling height of 30+ ft, which conforms to competition standard. 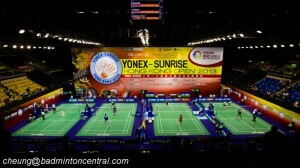 the lighting is T5 fluorescent located above the court boundaries. the T5 lighting is excellent. in fact, taking the crown from Bintang Campbell, i believe CBA now has the best and brightest badminton club lighting that i have ever seen. as a badminton photographer i am especially excited about that. all 18 courts will be covered with tournament badminton court mats. the total padding will be a full 10mm thick which should be adequate to dampen shock from continuous badminton activities. coaching will be a major part of CBA. being a coach and passionate about coaching herself, Rose will have a team of 4 badminton coaches. she has designed a unique systematic and complete badminton training program for students of all levels. with her connections in China, she is able to bring in international coaches to do clinics. i am personally very excited to hear that Xiong Guo Bao will be coming in July. Xiong is my idol who has the most amazing backhand, ever. aside from badminton, CBA will also offer 10 tournament grade table tennis tables. she will be hiring a couple of national and provicial level table tennis coaches. other amenities includes sitting areas, a meeting/activity room, a proshop and fitness equipment. after my visit, i was quite impressed with what i saw in CBA and its potentials. a lot of work still needs to be done and Rose will have a very hectic schedule to meet the late May grand opening schedule. i look forward to seeing the final product!